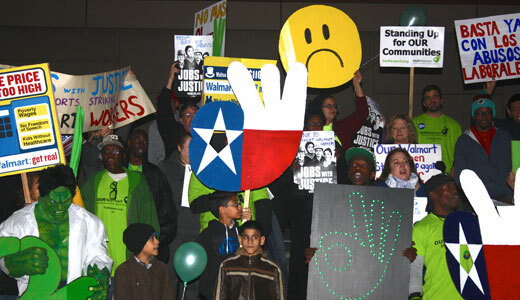 DALLAS – Activists and Walmart employees joined together to stage a protest at the Walmart Supercenter in Lancaster, a suburb of Dallas, Nov. 20. Approximately 80 people from a diverse array of groups, including the AFL-CIO, Worker Defense Project, United Food and Commercial Workers, and OUR Walmart, joined with 18 Walmart employees and sympathizers in an action that lasted nearly two hours. The assembled group sought to raise awareness of Walmart’s unfair and discriminatory employment practices, which include poverty wages, lack of benefits, and retaliation for the expression of basic workplace rights. The group sang and chanted slogans such as “Whose Walmart? Our Walmart!” while displaying signs giving disturbing statistics about Walmart’s profit strategies. The action, held on the edge of Walmart’s property along a busy frontage road, attracted a visible and positive response from passing motorists. After a brief confrontation with police and store management, Walmart strikers entered the property and picketed the store’s entrance. In response to this, an additional Walmart employee walked off the job and joined the strikers on the spot. Those present included Mark York, principal officer of the Dallas AFL-CIO, and Texas AFL-CIO President Becky Moeller, along with national representatives from the UFCW. Many of the Walmart strikers addressed the crowd to share their reasons for the action, along with tales of Walmart’s reprehensible employee practices. These included the company’s willful blind eye toward employee complaints and requests; the threat of retaliation, including termination, for taking action’ and a general atmosphere of gross disrespect from management. The strikers’ primary aim is to call attention to their need for higher wages to attain a basic level of economic security. Walmart employs approximately 1 percent of the U.S. population and offers an average annual salary of $15,576, well below the federal poverty level set at $22,050. In recent months, a nationwide movement has gained momentum to pressure Walmart into changing the practices that condemn a large number of Americans to poverty. According to the Bureau of Labor Statistics, if Walmart raised the average yearly pay to $25,000, 700,000 Americans would immediately rise out of poverty. This additional income, once injected into the national economy, would account for the creation of 100,000 new jobs. Demos published a 2013 report that concluded Walmart could accomplish this without even raising in-store prices. Walmart’s current agenda is seen as reflecting endemic, inexcusable greed among the company’s upper echelon, a fact that many rank-and-file employees will no longer tolerate. North Texas, along with Southern California, has emerged as a national center for widespread anti-Walmart sentiment, spearheaded by a broad coalition of current and former employees, along with pro-labor organizations and liberal sympathizers. The federal government has even weighed in with a recently announced decision from the National Labor Relations Board to prosecute Walmart for violation of workers’ rights. Organizers called the Nov. 20 action in Lancaster a broad success for its increased attendance and vibrant enthusiasm. They plan a follow-up event on Nov. 29, “Black Friday,” at the Walmart Supercenter in Balch Springs, Texas.